Destination Bollington – a reason to visit, a reason to stay! Bollington really is becoming the destination of choice! The Destination Bollington project is seeking to develop the good reasons for outsiders to come and visit us here in the Happy Valley – they used to call it tourism; now it’s destination management! Of course we have always had lots to see but we’ve been a bit short on things to do. People have visited the town for years to look at our mills, our quaint streets, the flowers in Water Street and, of course, the canal. But it doesn’t have quite the same attraction as some other small communities around us – and until relatively recent times there wasn’t even somewhere to watch the world go by over a cup of tea! (See cafés!) Probably the most common reason for visiting is to walk in the surrounding hills, along the canal or the Middlewood Way. We are very well provided with footpaths, the oldest dating from before Roman times and well used ever since! Those of us who live here know well what a great place Bollington is. Even so, many Bollingtonians are regularly surprised when they discover yet another fascinating historic fact, another beautiful corner to explore on foot, new people with similar interests, a great pub they hadn’t visited before, an artistic event they must attend. The town never stands still and very many people put in a tremendous effort throughout the year to develop their skills and their interests, and bring the pleasure to others in the town. But for all those people, we could always do with more – especially from outside the town. We need to give people from miles around an unquestionable reason for coming here, just for the day or to stay locally and make a holiday of it. Destination Bollington sprang out of the 2008 Town Plan and is designed to encompass many small projects aimed at improving the value of a visit and overall to create a central pleasure area. The discussion group was brought together by the Leisure & Tourism Officer for Macclesfield Borough Council (now Cheshire East Council) and has been taken under the wing of Visit Cheshire with the support of Cheshire East and Bollington Town Councils. The ideas began with the desire to further develop the Recreation Ground (Rec). This important area has been most successfully managed since 2007 by the Friends of the Rec, a group of volunteers with support from the wide range of users and groups such as Bollington Cricket Club , the Bowling Club, the tennis and football players, as well as other individual users. Cheshire East Council (and the predecessor councils at Macclesfield and Chester) have given the project much help in many financial and practical ways, and this important support continues. The collective achievements have been recognised every year since 2008 with the award of the Green Flag. The long term plan is to create a wider recreational area that encompasses the area from the Middlewood Way, through the youngsters’ play area on Adlington Road, the Recreation Ground, the woodland, Swinerood Wood, behind the Rec all the way to the canal, the Macclesfield Canal throughout Bollington, the waterfront at Clarence mill together with the rooms on the ground floor, and the young children’s play area on Palmerston Street together with the Memorial Garden opposite. The area provides direct access to the triangle of Water Street, High Street, and the part of Palmerston Street containing most of the shops. This is a big area with lots going on, with a few paths and the canal footbridge connecting Clarence mill to the Recreation Ground. There is clearly a need to improve many aspects of some of the areas outside the Rec and plans are being developed to do this. Consideration is being given to the requirements for a pavilion. The present building is generally regarded as unsuitable, and in the wrong place. We may not be able to move it but much could be done to improve the facilities and functional value. Major improvements have been made to the canal towpath. Much has been done to bring it up to an accepteble standard suitable for all potential users. A huge number of people use the towpath every day, and they are not all dog walkers! The opening of the canal footbridge at Clarence in 2009 dramatically increased traffic especially between the bridge and Hurst Lane. In 2007 a number of new finger posts (right) were erected to help guide visitors around the town to see the things they might well be interested in seeing. 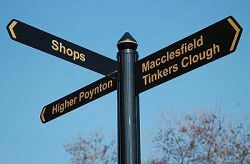 These signs have been added to in 2010, as a continuing part of the 2008 Town Plan project, so providing a comprehensive signage scheme that should ensure that all visitors can find their way about without difficulty. Also in 2010, four new double sided sign boards (left) were placed, two each on the Middlewood Way and the canal. These provide on one side a plan of the town showing all the key features including all the pubs, restaurants and cafes (please note that these are now somewhat out of date. This website is a better place to get uptodate information on such premises!). 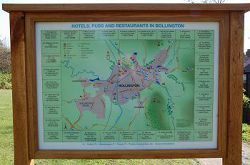 The other side of each sign is designed to give a potted description of the history and features around the immediate location of the board. On the canal these include a simplified map of the waterway, and on those at the Middlewood Way there is a map showing the key locations along the way. An important part of a visit to any town is the availability of retail outlets targeted at visitors. Bollington is not well endowed in this department. However, things are improving. There has been a noticeable revival of confidence in the town’s retailing. Several closed premises are now refurbished and reopened, others including TAPA Small Plates & Wine Bar and the Printshop refurbished. The Little Luxuries beauty salon is where Bollington girl Charlene Tildsley has made a therapeutic start to her business life, the off licence, all on Palmerston Street. The Lime Tree restaurant, TAPA restaurant and The Green café join Holmes~Naden estate agents in High Street. And breakfast can be obtained at Waterside Café at Clarence mill, and on the weekend, some pubs. West Bollington is not forgotten with Couzens Hairdressing on the corner of Wellington Road and Grimshaw Lane. At Bollington Cross it must be time for some re-building of the rather poor shops at Crossfield Road. Round the corner in Ovenhouse Lane we find the general store. Holmes-Naden’s old shop on Palmerston Street is now Papa’s Greek themed hot food take-away and café. Do you remember in the 1970s when this shop was a wonderful ice cream emporium? Wouldn’t it be great to see Hilly Billy ice cream from Blaze Farm being sold in Bollington!? Cool! Now that really would make Bolly a destination to visit! Many footpaths thread their way in and around Bollington, presenting many interesting routes to walkers. One such route takes you up onto Kerridge Ridge, and its fascinating monolith White Nancy, which dominates the skyline in Bollington. A walk up to White Nancy is rewarded with fine views over the Cheshire countryside. On the other side of Bollington stands an even higher hill, the Nab, which provides even better views (on a clear day!). In between the two is a network of easier footpaths, threading their way through the town. And up on the moors above Bollington lie many more adventurous routes for the enthusiastic walker! The Bollington Outdoors website presents several local walking routes, as well as numerous other suggestions for outdoor activities in and around Bollington. Two walking guide books have been written by Neville Bester, one each for the Vale Inn and the Poacher’s Inn . Each book presents 18 circular walking routes, leaving from and returning to the pub. The books are available for purchase from the Vale Inn and the Poacher’s Inn.